As most of my posts lately have, this post comes from troubleshooting connection issues. We’ve all seen certificate issues, DNS, routing and firewalls cause us pain, and far too often we jump right to those things as the root of a new problem; overlooking the workstation and the ancillary applications running on it. We did all the standard testing you would expect including pings, telnets, PortQry, digicert site to check the certificates and what we found was everything looked ok. To rule out environmental issues on the client I asked Alan to send me a Live Meeting invite to try from my machine. I was immediately able to connect to the meeting with audio/video, no problems at all. At this point I started asking the standard workstation related questions. Is your firewall on? Is anti-virus on? What kind of anti-virus is it? Can you turn it off and try again? 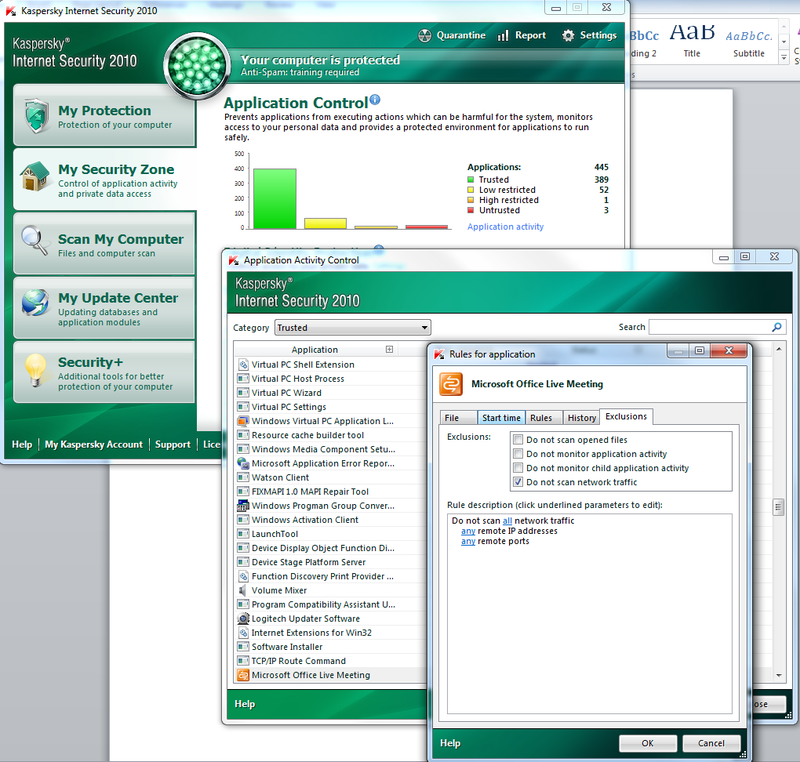 The firewall wasn’t on, but anti-virus was (as it should be), in this case it was Kaspersky Internet Security 2010. Alan disabled Kaspersky and re-joined the meeting and we were both able to connect to the audio/video feed. Alan spent a few minutes digging through Kaspersky and found the setting that was causing the issue, a quick modification to the Kaspersky settings (as shown below) and everything was working as expected. Sometimes when your configuration looks right it is; you may just need to look at the client. This entry was posted in Uncategorized and tagged kaspersky, Live Meeting, OCS 2007 R2, Please rejoin audio and/or video, Your audio and/or video session was unexpectedly disconnected. Bookmark the permalink. We just met same issue. Now we will need to make more accurate rules for Kaspersky. Becouse its very poppular in our region. And just turn off network traffic scan is not an option. Glad the article helped! You may be able to work with Kaspersky support to identify other configuration options, I’m not a Kaspersky expert so I can’t suggest anymore than what is shown above. If you do find a more secure setting that allows Live Meeting to work please post back and share if you don’t mind. this was exactly the problem I had.